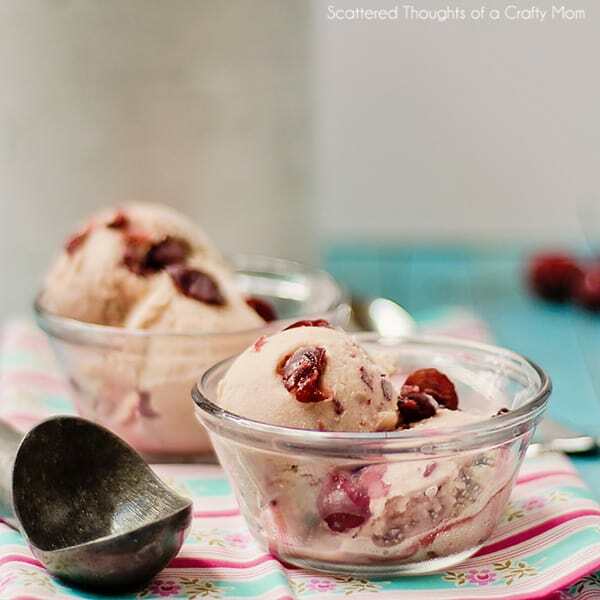 The combination of rich, custardy vanilla ice cream and sweet cherries make for a decadent Homemade Cherry Vanilla Ice Cream Recipe that you don’t want to miss! My Mom, Dad and Brother’s family were visiting earlier in the month and we decided it was the perfect time to make Mom’s Homemade Vanilla Ice Cream (no-cook) recipe. My mom made this ice cream for us all the time when we were growing up. It tastes a million times better than any store bought vanilla! Of course, people have been eating raw eggs for years – if this doesn’t bother you, skip the cooking of the custard base and go straight to the ice cream maker. 12 to 16 oz of fresh or frozen pitted cherries. Add milk, condensed milk, eggs to a saucepan over low heat. Beat/whip eggs with the milk until thoroughly combined. Keep stirring until the mixture is thickened and coats the back of the spoon. Optional (for a faster cooling time): place saucepan in an ice bath and continue stirring until cool. Optional step 2: strain custard base through a fine mesh sieve to remove any lumps. 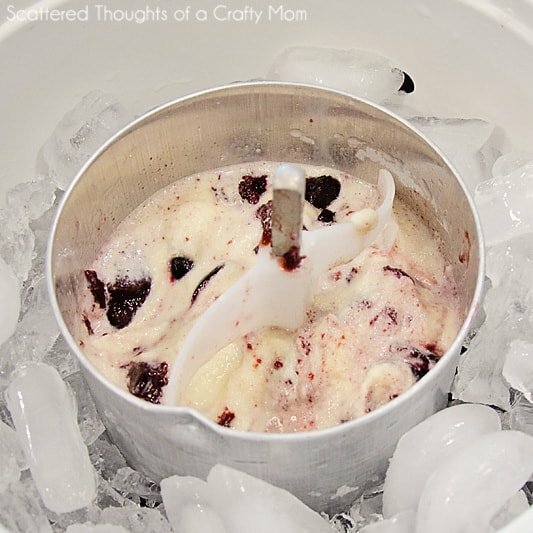 Add the ice cream/custard mixture to your ice cream machine and follow manufacturers directions. Add 3/4 of the cherries and 1/2 cup sugar to a small saucepan and heat over medium heat until cherries soften- about 8 to 10 minutes. 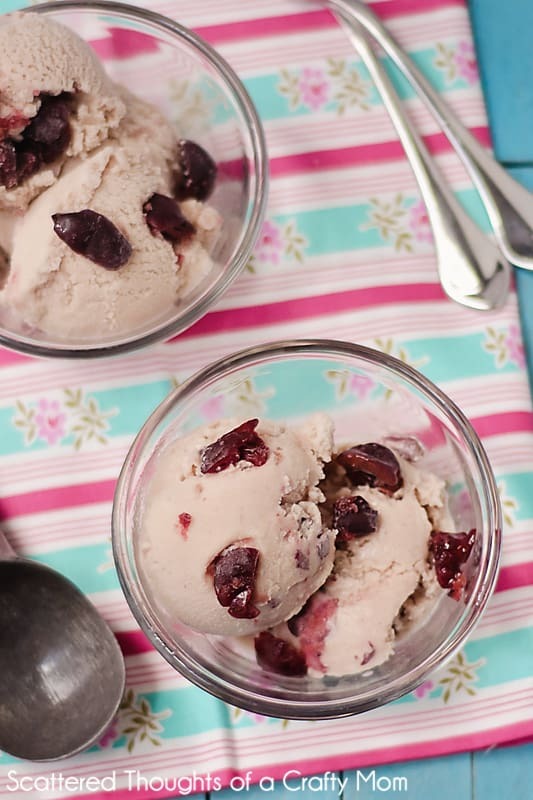 Transfer cherries to a blender or food processor and process until smooth. 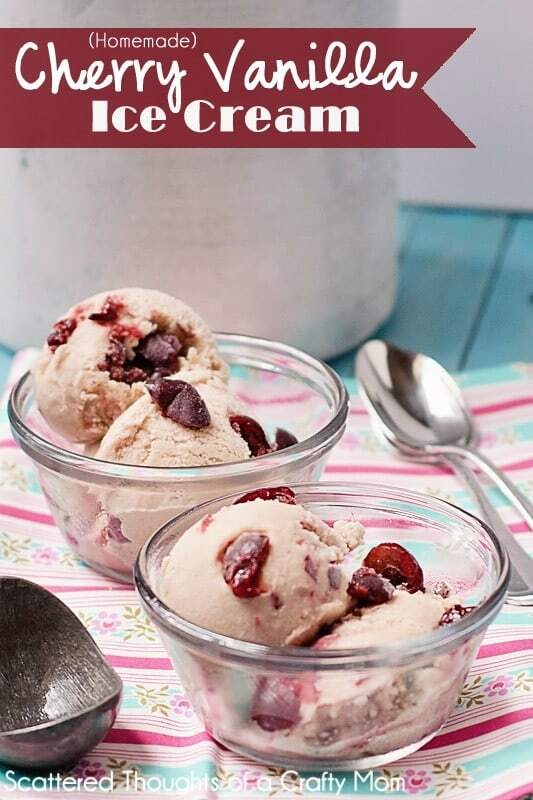 Dice the leftover cherries and put in the freezer too. 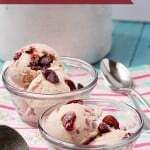 Once the ice cream is nearing completion, open the lid and spoon the cherry syrup and diced cherries into the ice cream. Use a long spatula to distribute some to the bottom. Turn the ice cream machine back on and let it complete the cycle. I have to have an ice cream maker very soon! I loved this ice cream…yum! I am curious as to why you want your eggs pasteurized ?? This recipe is no cook and the eggs are raw. My father is immuno-compromised and I have small children. If for some reason I got a contaminated egg, their immune systems would have a tougher time fighting off the germs. By using pasteurized eggs, the threat of salmonella from the eggs is eliminated. Super delicious looking ice cream!! This looks yummy! I LOVE cherry season! You have an error in your recipe- condensed milk?! Not an error, the recipe calls for a can of sweetened condensed milk.